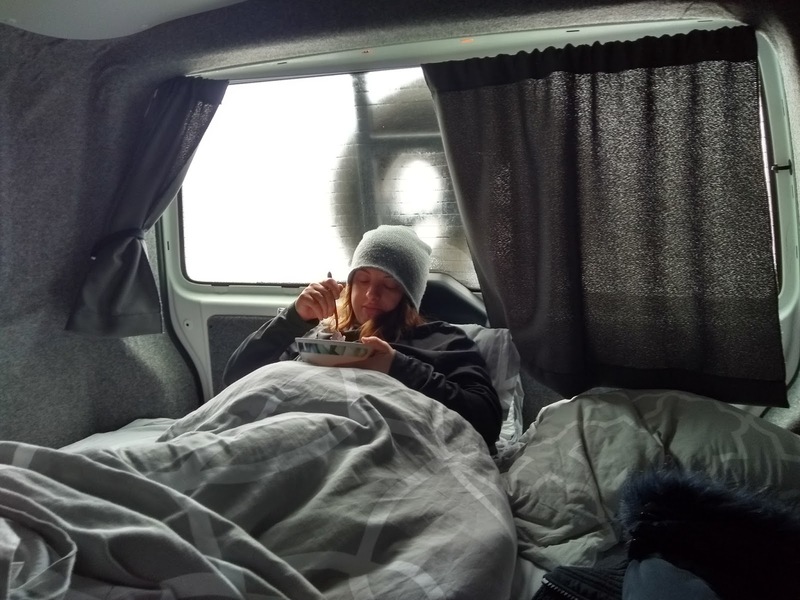 We've been living in campervan for just over a week. 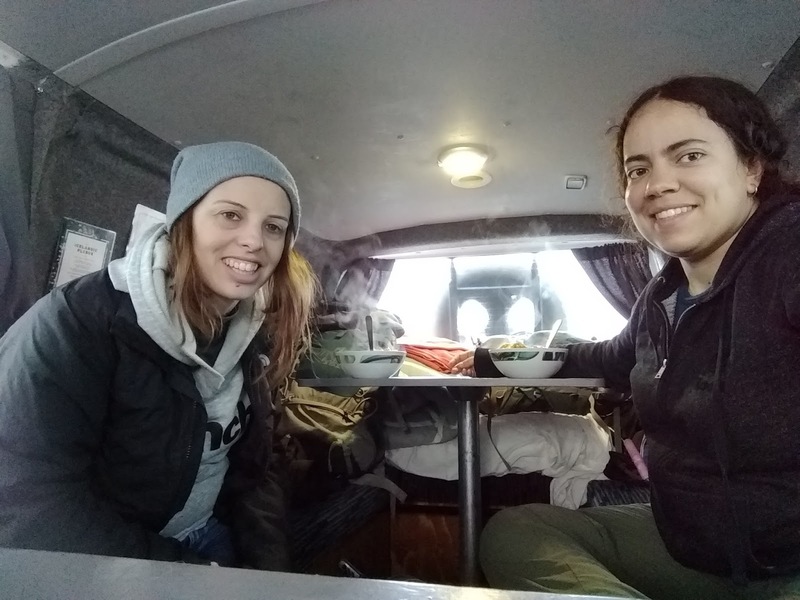 Long time readers will recall the 23 days Jen and I spent living in a tiny sleepervan in New Zealand that we affectionately named "ol' 1997", due to its age (yet it still managed to drive us 5000km!). Our campervan here in Iceland is a bit bigger. We rented from CampEasy, which is so far turning out to be a very lovely, responsive company. They automatically upgraded us to a 4x4 before we arrived, and gave us free Wifi on board due to not having the van quite ready when we arrived. The van itself comes equipped with a sink and fully functioning tap that draws water from a large tank that we can easily refill. There are several drawers that come with all the cutlery, dishes, and pots and pans that we need to make simple meals on the campstove that it also comes with. Just behind that, occupying the other half of the back of the van is our living area. During the day, there is a large table with three spacious benches around it. At night, the table easily comes apart in two pieces, which we lay on the ground and then quickly assemble the bed by putting three metal rods into slots and then laying the back-cushions of the seating area on them, and there we have our bed. There is also a heater in the van, which CampEasy has smartly hooked up to two external batteries that charge as we drive. This enables us to have the heater on full power all night long. Oh, and of course the fridge, also connected to the external battery, to keep our groceries. 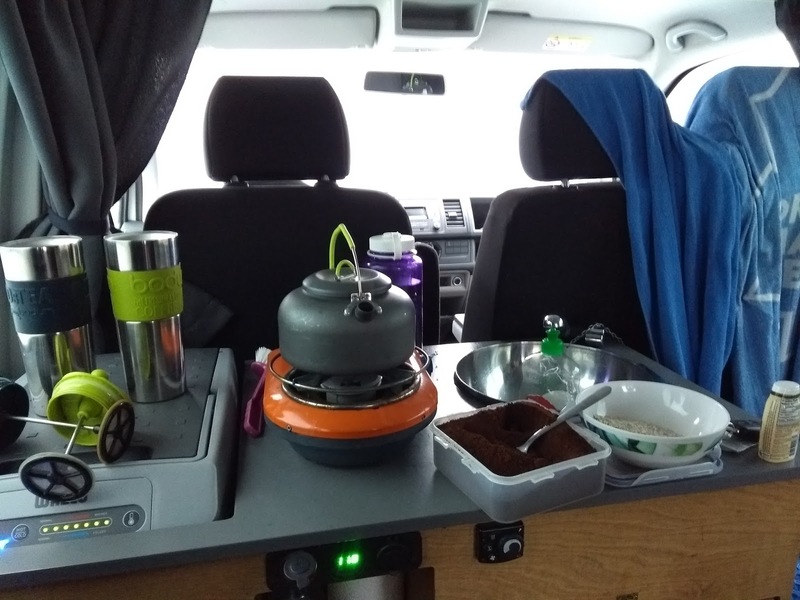 It's quite a nice little system, and it feels like a luxury over our little NZ sleepervan to have this set up with the cooking indoors, a heating system, and a higher van so we don't have to sit crouched over while in bed or cooking. We've named her Selja (pronounced SEL-ya), after one of our favourite waterfalls here, Seljalandsfoss. The camping situation in Iceland is not quite as organized as the one in NZ. Iceland recently made freedom camping illegal, which requires you to find a proper campsite for the night, register, and pay the per-person fees. We are fine with all this; however, finding campsites that are actually open in winter time can be a bit of a challenge. They are few and, in the north, far between. Thankfully CampEasy provides a neat little map of campsites that are sure to be open in the winter, so we planned our itinerary loosely around those, to ensure we'd always have a place to stay. Most of the campsites cost about $15-$20 (CAD) per person, and at minimum have an indoor bathroom. 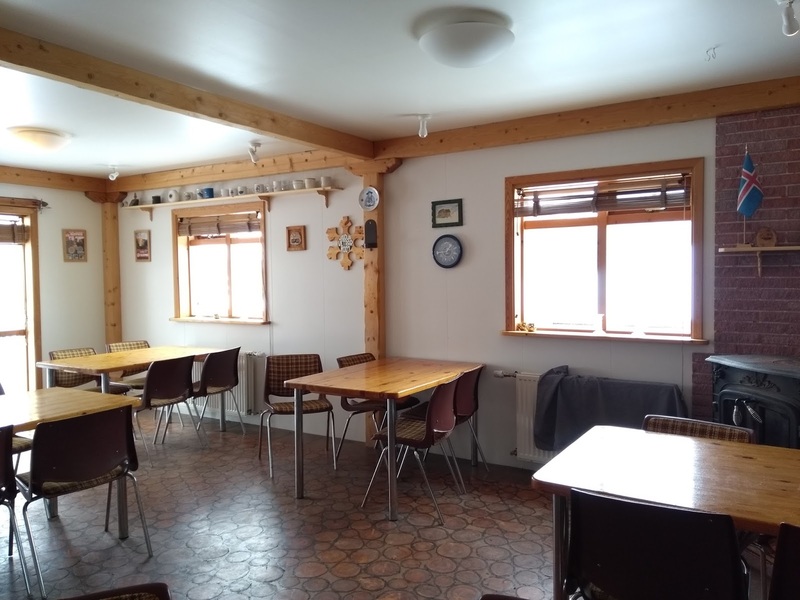 Most of them have had indoor kitchen facilities as well, and several of them have had access to hot showers (sometimes free, sometimes for a small fee). 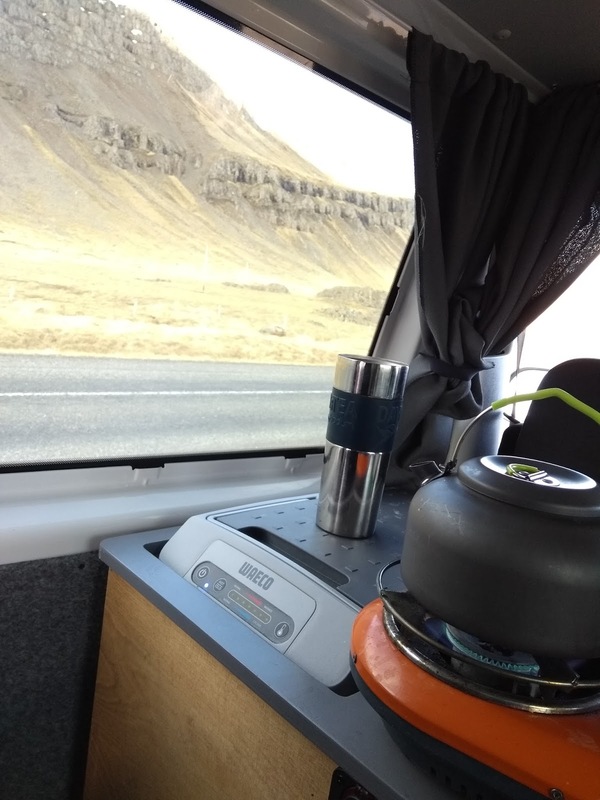 We've camped in some beautiful places, like just down the road from Seljalandsfoss with a view of the falls from our window, or nestled in the silence of the national park's mountains and glaciers. 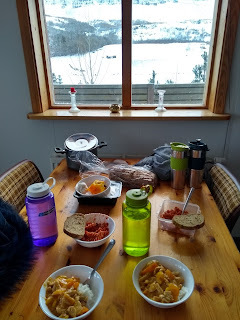 We've also camped in some more unexpected places, like the parking lot of a Guesthouse beside a closed, frozen swimming pool. Last night, however, was probably the most... let's say, UNIQUE, experience we've had while camping in Iceland thus far. We arrived at our campsite for the night, finding only a very large, empty parking lot, a tiny building labelled "reception" that was clearly closed, and a sign that was overly-excited and announced "Camping!" with a large arrow. We followed the arrow only to find another empty parking lot, a large field, what looked like small, closed guesthouses, and a very old looking building painted orange, with a wooden door and faded painted letters spelling a word we could not decipher. After checking all the doors on the initial building and finding them all locked, we determined the place was closed. Now what? There were no other winter campsites open nearby, and sunset was fast approaching. We didn't want to be "those tourists" and freedom camp illegally, but what other choice was there? As we were deciding what to do, another campervan pulled up, and two friendly German guys hopped out. We started up a discussion with them, as they had planned on camping here as well. One guy pointed towards the mysterious orange building, saying "That's a library" (I guess he knew some Icelandic!) and they decided to go inside and ask if anyone knew anything. We gingerly followed. There was an extremely elderly gentlemen sitting at a small desk inside a very small, adorable one-room library. Another younger man was at a table reading, and the German guys conversed with him in English, as the librarian only spoke Icelandic, and they managed to use Google together to find a contact number for the owner of the apparently closed campsite. Back outside, one of the Germans called the phone number we had been given. He explained our situation and, after a few minutes, hung up and said "Well, he said he's on his way over to unlock the facilities for us. He honestly didn't seem that surprised to have guests." (You have to wonder why his number is so hard to find and why it isn't posted on the closed reception door at least...) As we stood around together waiting in the cold, we see a young boy run across the field over to a building a little ways away. One of the Germans remarks, "I think I see a sign on that building - he must be running to open up the kitchen and bathroom building for us." A few minutes later, the doors open and out comes a herd of black and white sheep! We all start laughing. "I don't think that's the kitchen!" his friend said. "Sure it is!" he said back, jokingly. "They're clearing it out for us!" Finally, we see a truck and trailer coming down the driveway towards us. Out hops an Icelandic man and says "Come, I show you kitchen and bathrooms." We follow him as he disappears quickly into the building next to us. There is indeed a very nice kitchen in there, and he plays around with the switches in the fuse box until the lights come on. "Do you have showers?" asks one of the Germans. The man says "Yes, go in your car, follow me." He hops into his truck and starts to drive. The four of us look at each other. One of the guys says, bemused, "Are we showering in Reykjavik?" as we pile into our respective campers and drive after the man. As we drive after the Germans who are struggling to keep up with the speeding Icelandic man, Jen and I burst into fits of hysterical giggles. "What is happening?! Where are we going?!" I say in between laughter, when I can take a breath. "I don't know!" Jen says in between her own fits of giggling at our suddenly very strange situation. There's nothing to do but follow, so follow we did. Tears are running out of my eyes at this point as I try to contain my laughter. I don't even know why I find the situation so funny. Perhaps the wry humour of the German guy held some truth - where on earth are we driving to shower? With that eventful part of the evening over, we all returned to our respective campervans and started on dinner. Later that night, Jen and I set up our usual Aurora watch. Me blogging in the front seat, her beside me, periodically wiping the condensation off the front window so she could watch the skies. As I mentioned in last night's post, we saw a very faint grey spot in the sky. The camera picked it up as very pale green, meaning it was a very weak aurora. We periodically would go outside and check the grey spot with the camera, to see if it was getting any stronger. No luck. At around 1:45am we decided to call it a night, and walked over to the bathroom building to get ready for bed. On our way out, we looked up at the sky and saw a large, white-ish glow. "Do you see that?" I asked Jen. She did. We quickened our pace and went back to where the camera was still propped on the tripod outside the van. I let my eyes re-adjust to the dark. The grey, cloudy-like formation had definitely deepened into a milky white - and it was changing. Jen and I looked up at the sky in wonder. "This is really happening!" Jen said. We were watching the aurora. Suddenly, a shooting star appeared right beside it, and we both gasped and hugged each other. Could it be any more magical? One of the Germans was out for a smoke, and came over. "Do you see anything?" he asked us. We pointed at the sky. "Oh wow, that's it," he said, and went to go wake his friend up, as well as the other two girls who were also in a nearby campervan. 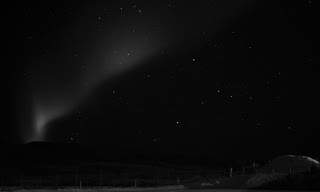 The six of us stood there, in the freezing cold temperatures, as the white glow increased, reached upwards high into the sky, and then started to spread horizontally, faintly rippling as it moved. Fascinated, I clicked on my camera every once in a while to take a photo of what was happening. The aurora wasn't green to the naked eye tonight, but the camera caught the green hues, as well as a few faint purples in the places where to the eye, it looked a very deep white. A TINY bit of purple in there, on the left side near the bottom. Jen and I stayed up for a while longer, waiting to see if it got any stronger, but it eventually faded back to its previous, barely visible cloudy grey, and we decided to finally go to bed at around 2:30am. It was a special, wonderful moment. A tiny taste of a true aurora, rippling across the black, star-studded night sky. We are hooked. We can't wait to one day see more. Great blog! We somehow found it. Now we're quite amused about our pleasent guest role in your journey. It was nice to meet you! Best regards, lot's of excitement and safe travels. The two germans.